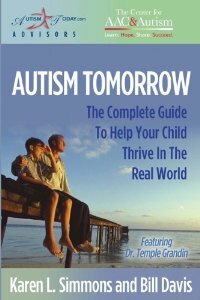 Autism Tomorrow to Help Your Child Thrive in the Real World by Karen L Simmons and Bill Davis. In this book you will learn about estate planning, independent living, nutrition, fitness, employment, safety, sexuality, puberty, dating, bullying, reading, social skills, and communication. Pp. 225.